On the 20th of December, 1860 an explosion occurred at the Hetton Colliery, Durham, by which 22 men and boys were killed. Fortunately this occurrence took place in the evening soon after some 200 men and boys had ridden to bank, and when none but the stone-men were down the pit, or the result would have been more terribly fatal. There does not appear to have been any suspicion of the presence of gas in this case, for the reports as to the ventilation, timed up to a very short period before the disaster, exhibit a deal of confidence in the freedom of the pit from that dangerous element. The Miners of Northumberland and Durham by Richard Fynes. Minor Pit. Hetton, Durham. 20th December, 1860. There were three collieries that constituted the ‘Hetton Collieries’ and they were owned by the Hetton Coal Company. They were the Hetton, the Elemore and the Eppleton pits and they were about a mile apart from each other with the Hetton pit in the centre, the Elemore lying about a mile to the south west and the Eppleton which was also known as the Downs pit lying the same distance to the north east. All the collieries had separate ventilation systems with two shafts at each colliery, one a downcast and one an upcast. Two seams were worked at the Hetton colliery, the Main Coal Seam at 109 fathoms and the Hutton Seam at 148 fathoms. The Low Main Seam at 131 fathoms had been partially worked but was not worked at the time of the disaster. 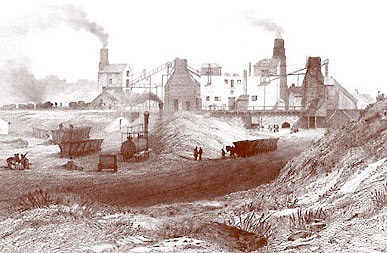 The colliery had three ventilating furnaces in the Hutton Seam and one in the Main Coal Seam. The area of the downcast was 98 square feet and the area of the upcast 132 square feet. In the past, gas from the coal had exploded at the boiler doors but no damage had been done but in the case of this tragedy there was a long and nearly level flu in which a large amount of gas accumulated and the violence of the resulting explosion was like a cannon through the workings. William Marley aged 58 years a furnaceman. John Greeves aged 20 years a timber leader. Ralph Ross aged 16 years a timber leader. His father was in Australia and he supported his mother, two sisters and two brothers who were at work but reported to be delicate. These three were found near the furnace in the West Minor pit. Thomas Robinson aged 36 years a hewer. Henry Wonders aged 28 years a hewer. George Walton aged 16 years a putter. J. Soulsby aged 16 years a timber leader. James Walker aged 32 years a deputy. Fr. Gray aged 29 years a deputy. Joseph Scott aged 50 years a shifter. Thomas Wright, aged 43 years a shifter. Thomas Sunderland aged 32 years a shifter. He supported his mother and two sisters and two children whose father had gone to Australia. John Gibbon aged 63 years a shifter. John Ferguson aged 62 years a shifter. Anthony Young aged 52 years a shifter. Robert Hall aged 17 years a shifter. Thomas Mitchinson aged 61 years. Robert Wilson aged 54 years a shifter. John Lowdon aged 63 years a shifter. The inquest was held at the Colliery Hotel, Hetton-le-Hole before Coroner, Thomas Christopher Maynard. George Lowden, overman, told the court that he went to work to examine the workings at 2.20 a.m. He had two colliers, Robson and Warders and two boys Walton and Soulsby under his charge. He was also with the rescue party and found the bodies of Hall, Box and Richardson in the return. At the conclusion of the inquest it was suggested that, in order to prevent similar occurrences in the future, flues should be constructed to have a continuous rise. The fire in the north stables was not extinguished for about six weeks.